To be honest, I must tell you guys that I squealed in delight when I saw these amazing and oh-my-sweet word so romantic rose cabochons. And when I saw the trays - well, then I knew they were the perfect match! Aren't they gorgeous?! The other three are immensely soft and delicate and equally enchanting! They are for sale here. These are so pretty and have such a wonderful vintage vibe. ALL are gorgeous. 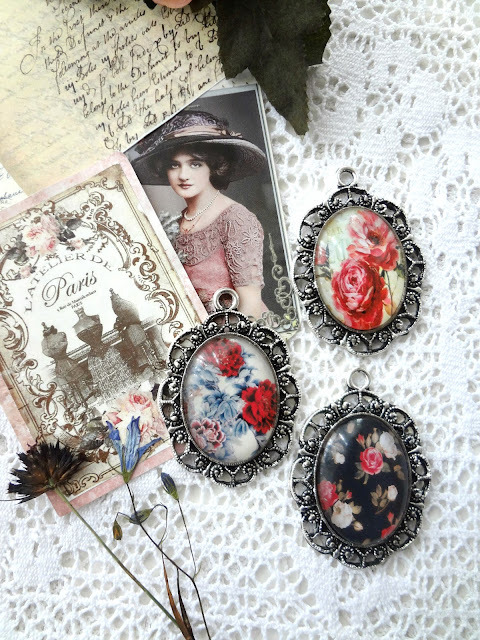 I can see these cabochons being fashioned into so many pretty ways. Thank you Kim! I am going to try and mix one with my crochet whimsies.